Pakistan Movement (Tahreek e Pakistan ) 1. In 1925 he presided over first All-India Sunni Conference, giving the keynote speech. Then in September 1935,having been declared the " leader of Muslim Community" (amir-i-millat),at a special conference of the "United Muslim Community" (ittihad-i-millat),he stressed the need for love of Prophet saws followed by the need for active propagation of Islam, for unity of Sufis and Ulama. Throughout the Pakistan movement,Sayyid Jamaat Ali Shah (r.a) supported Mohammad Ali Jinnah and Muslim League. 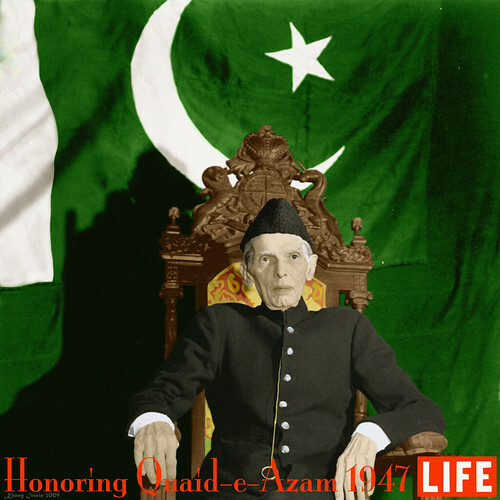 At the 1946 All-India Sunni Conference, he publicly exclaimed (to counter those who accused Jinnah of being non-Muslim), "Jinnah is an intimate of God." The conference was attended by 500 shaykhs, 7000 ulama, and over 100,000 other people, which encouraged the Muslim League to form Pakistan. A committee with many scholars and Sufis was set up to make sure that the new Pakistan government would be Islamic. He was in Hyderabad,Deccan when he heard about attack on Quid e Azam (r.a) with a knife. He immediately dispatched Bakhshi Ghulam Mustafa Khan (r.a), his Khlifah to Bombay with gifts and a letter for Mr. Jinnah.He wrote " The nation has given me the title of Amir e Millat and I should be doing what you are doing for the creation of Pakistan however I am more than 100 years old with fragile health. My responsibility is on your shoulder therefore it is my duty to help you .Nimrud's opposition to Abraham (Hazrat Ibrahim),Pharoe's (Firoon) opposition to Moses (Hazrat Musa )and Abu Jahal's animosity for our Noble Prophet (saws) became the reason for the success of their Prophetic Mission .This attack on you will become a good omen for your success.I congratulate you that you will succeed in your mission and do not worry about the difficulties you will face to achieve your goals.Whosoever Allah Taala wants to succeed,to test He creates enemies. I pray to Allah Taala that your enemies will face defeat.I and my fellow disciples (Yaran e Tariqat ) will fully cooperate and help you.You also promise to not deviate from this noble mission. "The gifts included Quran, Prayer Rug,Prayer Beads,( Tasbeeh),Shal,blanket and other precious items.Bakhshi Sahib delivered letter and gifts to Muhtarama Fatima Jinnah since doctors did not allow any visitors.Mr. Jinnah responded after few days "With prayers of pious persons like you, I definitely will be successful.I promise to you that whatever difficulties come my way,I will continue to pursue my mission.. You have sent me Quran for the reason that I am a Leader of the Muslims.I cannot lead without knowledge of Religion (Din) and Quran.I promise that I will read Quran.I have acquired English translations.I am searching for a scholar who can educate me in English.You have sent me a prayer rug for the reason that if i do not obey Allah 's commands then people won't obey my commands.I promise that I will offer prayers.You sent prayer beads so that I recite blessings on Prophet (saws)-Darud Sharif.The person who does not seek blessings & mercy of Allah Taala on Prophet (saws),how can he himself expect mercy from Allah Taala.I will follow this suggestion as well.When Quid e Azam 's letter was read to Amir e Millat (r.a) ,it made him extremely happy and said " I am in Hyderabad Deccan and Jinnah Sahib is in Bombay then how could he perceive my intentions which I did not express in my letter. No doubt Jinnah Sahib is friend of Allah (Wali'Allah)..
very nice article, worth reading. i dint new few things you stated here coz i've studied those subjects.